While I used “micro-finance” in the title, because that’s the name of the program at Trinity Foundation in Cali, I feel the need to say that many of my colleagues in the field have often expressed that the use of the term “micro-finance” is pejorative and reflects a North American perspective. There is nothing “micro” about a $100 loan to a family that survives on a few dollars a week. To many of us, $100 might be about half of a weekly grocery bill. To the poor of the world, $100 can represent the savings of a lifetime. That said, in late May I went to Cali to attend Diocesan Convention. I had heard about a loan program at Trinity Church, and wanted to learn more about it. So I went to Cali earlier than needed, to give me a chance to meet with Fr. Antonis, the Foundation staff, and some of the people in the program. The Trinity Foundation is church-based and functions as an umbrella organization for several social services. The Micro-Finance Program, funded by Episcopal Relief & Development, provides small loans to approximately 60 people (mostly women), The Freedom from Hunger Program provides daily lunches to 70 poor children, ages 1-5, most of whom are indigenous, and once a week a meal and an opportunity for community for 20 senior citizens. People participating in the loan program receive funds for education, health, business development and life improvements. Young and middle-aged participants tend to want assistance with training and education, or to purchase supplies to begin or grow a business, while older people tend to need assistance with health needs or general life improvements that fall outside of state provided healthcare or social services. In Jarillon del Rio Cauca, a poor neighborhood on the edge of Cali, where when it rains the river rises and homes flood, I met with a group of people who gathered to share their stories. They were excited to share, and equally excited that “their” missionary wanted to hear their stories and learn from their experiences. Leandra told of needing help to buy supplies to set up her business. Given the expense of childcare, her only option for work was a home business. The loan made that possible. Others shared that they had started sewing businesses, expanded their roadside shop, taken classes that enabled them to get a job, or were able to have needed surgery. The most important message I heard about the program, though, wasn’t about money. Everyone spoke about how it enabled community. All talked about how they found each other through the program and how they now draw upon each other for support. And, of course, an important part of that community is the involvement of the foundation staff and Fr. Antonis. What the participants found is that they work harder, knowing they are part of something bigger than themselves, and that they have a place to go when they need advice and support. For example, one man expressed that expanding his business was great, but that he didn’t know how to manage such a large business budget. The group was there for him to help him think through, and develop, systems for budget management. We often talk about words like “accompaniment” and “empowerment,” but I’m not convinced we know what they mean. They are the “magic words” of the moment that get tossed around in meetings and included in grant applications … that is, if we want to get funded. In my mind, the folks in the micro-finance program at Trinity Church are living into a process of accompaniment and empowerment. And guess what? “We” didn’t do anything to make it happen. There weren’t any “measurable goals” outlined in a grant application. No one created a goal that for every $5 invested through the program, there would be a new “empowering relationship developed” … whatever the heck that would mean anyway. 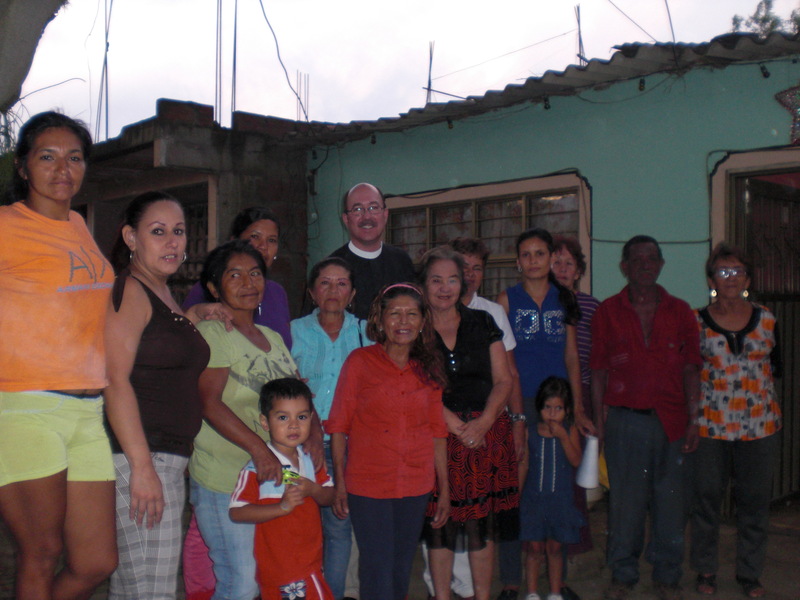 Leandra, Leonor, Ileida, and the rest of the loan funded community united through their mutual relationships with Fr. Antonis and the Trinity Foundation staff. They found each other and created community. They meet regularly for support, advice, and worship. It wasn’t a measurable goal that enabled community, but rather the combination of a much-needed loan program, a caring church community, and the work of the Holy Spirit. In Jarillon del Rio Cauca I saw the hand of God at work in a poor community and, as a business type who often finds himself writing those measurable goals for grant applications, was both humbled and energized to continue to learn more from their experiences. “Microcredit” is the term Muhammad Yunus uses. If the “micro” bit unsettles some of your colleagues, so be it. Moving right along, this is a wonderful post, Ted. Thanks. Amen, Ted. Unfortunately, our condescending grant language and unrealistic expectations can get in God’s way — as well as wo/man’s. Your listening heart will make a huge difference in the lives you touch (and the lives who touch you).